Today marks the opening of M&S department store in The Hague, The Netherlands. Located on the busy high-street, de Grote Marktstraat, the 52,000 square foot store spans three floors and includes a 7,500 square foot food hall, making it the largest M&S store in the EU outside of the UK. 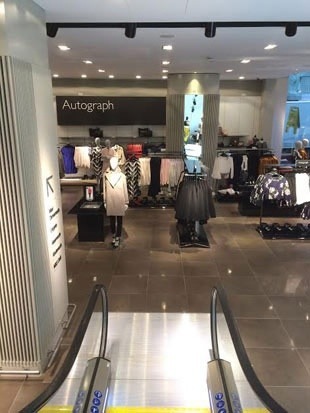 The opening of the flagship store in The Hague marks M&S official re-entry into the Dutch market, after the department store group shut down its previous store in the city and withdrew from the country over ten years. “The spectacular De Markies renovation at the heart of The Hague offers us a unique opportunity to offer our customers something truly special. As our largest store on the Continent, we’re showcasing our most extensive fashion and food offer in The Netherlands. We’re really looking forward to welcoming customers to the store today,” commented Marc Bolland, chief executive at M&S, who will be joined by the UK Ambassador to The Netherlands, Sir Geoffrey Adams to officially celebrate the store’s opening. Although M&S opened a smaller store in de Kalverstraat in Amsterdam last year April, which features a food hall and e-boutique, it was more of “a teaser” for the flagship store to come, commented Francois Smeyers, regional director for M&S Europe. Alongside with M&S’s Dutch website, Marksandspencer.nl, and M&S Food pilots at a number of BP tank stations throughout the country, M&S has build up its brand presence in the country. “The [Kalverstraat] store is trading really well, absolutely. For us, it was the confirmation needed to confirm that it was a good idea to return to The Netherlands. The Dutch public has embraced us. That is also evident in the number of visitors the store draws and the amount of orders placed in the webshop, The Netherlands is already ranked in the top 10 of online shoppers,” adds Smeyers. He comments that the flagaship store in The Hague focuses on the British identity of the department store retailer. The flagship store offers M&S’s Best of British Spring/Summer capsule clothing line, as well as the department stores other menswear, womenswear, lingerie and childrenswear. The store also offers customers the chance to online items online in-store via sales associates iPads, with free delivery for picking up orders in-store. In 2016, M&S plans on opening an even bigger flagship store (66,000 square feet) on the Rokin in Amsterdam. Posted on February 20, 2014, in #international, #retail, #uk. Bookmark the permalink. Leave a comment.